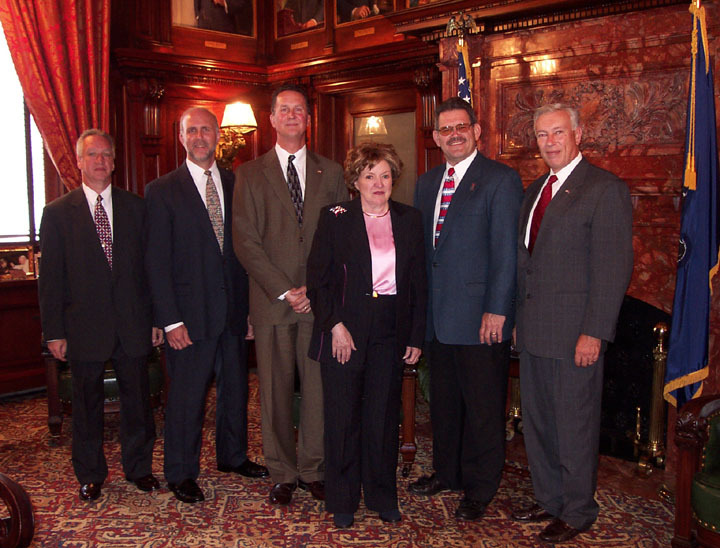 Harrisburg, The Pennsylvania Capitol, October 14, 2003 - US Life Safety's president, Steve Burchesky, presented the company's new "Life-Counts ®" emergency preparedness compliance tracking program which is intended for all state owned buildings. It was warmly received with great interest and enthusiasm. From left; Director Philip Fredericek (Security and Safety/House of Representatives), Jim DiBasilio (US Life Safety), Steve Burchesky, Lt. Governor Catherine Baker Knoll, State Rep. Tim Solobay, and Director Keith Martin, Office of Homeland Security/Office of the Governor. All contents © 2003-2019 US Life Safety, Inc. (Formerly AVID Productions). All rights expressly reserved. Content not held under copyright by US Life Safety, Inc. is used with permission in accordance with the Fair Use Doctrine of the United States Copyright Law.